Ok, I'll keep this quick(ish). The kitchen freezer isn't doing too bad, in fact, it's seems kinda full of veggies and not much else at the moment. The only full size container at the moment is the Turkey Hill froyo, everything else is a pint. The treat box is also near empty, though I do have a few refill items in the basement from blue bunny, breyers, and stone ridge creamery. The deep freezer, well, I should probably defrost it. I've got a strawberry fro-zing which I never tried (it came with the raspberry fro-zing I reviewed).I really have to get this thing emptied out before I buy anything. I'd say it's more Haagen-Dazs than anything at the moment. There are also some personal sized containers that I need to review. Unfortunately I do sometimes use the deep freezer as a dumping ground for samples I don't want to try, but feel guilty throwing out (fro-zing, tart froyo, some stonyfield farm froyo that got buried and is probably bad by now, you get the idea). The blog continues to grow which is great and we had our first contest, which was just awesome (i'm still organizing my own sonic trip, so stay tuned for that). I don't foresee any massive changes in the near future... well, I have several ideas to help the blog grow, but I'm not sure how much time I have to work on them. I guess I just have to pace myself. Oh, I want to thank everyone for using the new flavor review request box on the right side on the page. It's linked to a google doc so I go in and check it every few days. I take notes and use it to help figure out what I need to try next. So, the poll was probably the most pointless question ever in retrospect. The point I was trying to scoop at was that I wonder if people go to the store looking for say "Rocky Road", or do they go to the store looking for say "Haagen-Dazs". Well, or thirdly, do they go to the store thinking "When can I get with three bucks?". Now I call this poll pointless because 100 out of 143 people votes for flavor. I'll try to phrase for polls better. 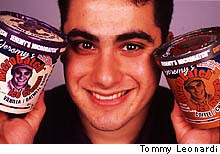 I did a quick search for Tiramisu ice cream when I came across this August 2000 article about a 24 year old who started MicroBatch Ice Creams Inc in college. It's a positive article and speaks of a predicted 1.6 million dollars in 2000 sales for the company. I went to look up this fast moving little company and came upon this February 2001 article which shows the company died in October 2000 after it burned too much on it's marketing budget. They say that ice cream is a $21 billion dollar industry in the US alone, so it makes it that much more painful that they get that far and then still come crashing down.